The Gorkha Janmukti Morcha has demanded the introduction of a bill calling for inclusion of 11 left out Gorkha sub-communities under the ST category. Here is a full press release issued by Bishal Chettri, Vice-President of the GJM (Bimal) group. “Today a high level team led by Darjeeling MP and Minister of State for Electronics and IT Shri. SS Ahluwalia, GJM members Shri. Bishal Chettri, Shri. Anil Lopchan, Shri. Rohit Thapa, and Gorkha history expert Shri. 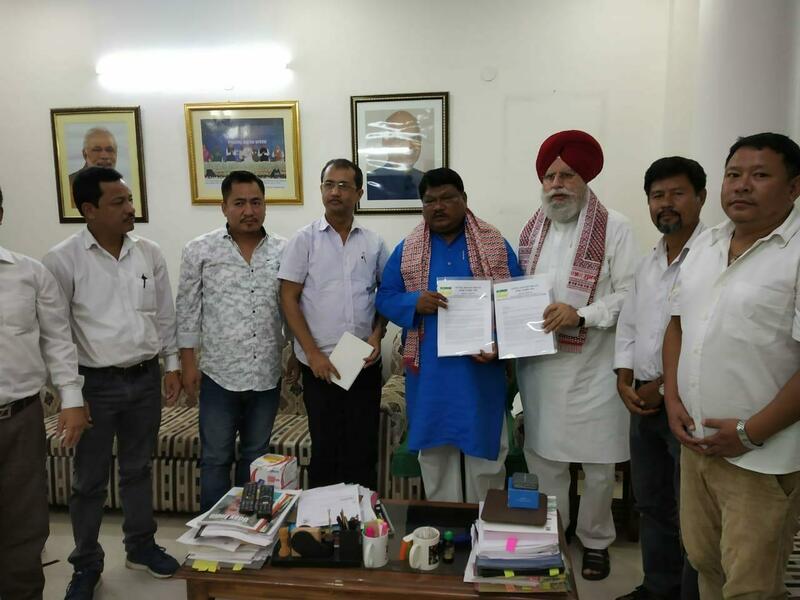 BP Bajgain, Members of Himalayan Forest Villagers Organization representatives Shri. Lila Kumar Gurung and Shri. 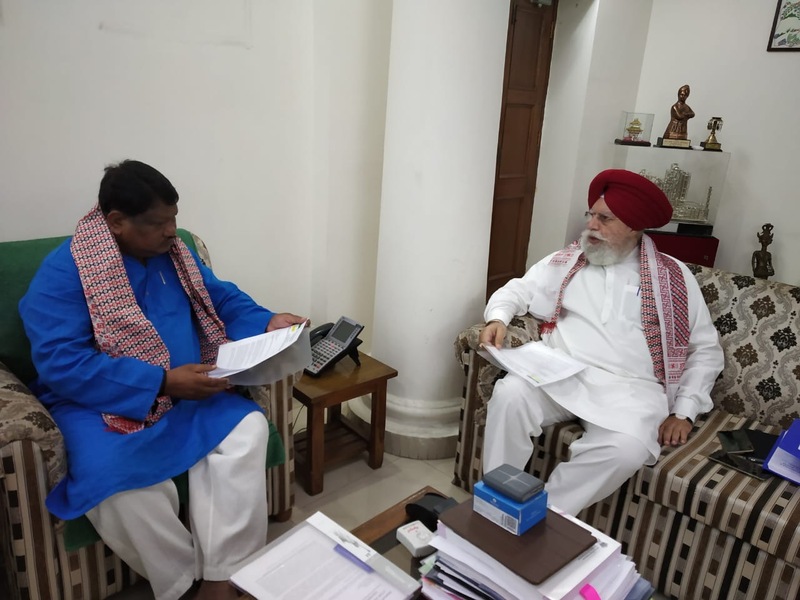 Lal Sing Bhujel met with the Union Tribal Affairs Minister Shri Jual Oram to press for the introduction of a Bill calling for the inclusion of 11 left out Gorkha sub-tribes – Bhujel, Gurung, Mangar, Newar, Jogi, Khas, Rai, Sunwar, Thami, Yakkha and Dhimal as the Schedule Tribes of India, in the upcoming winter session of the Parliament. 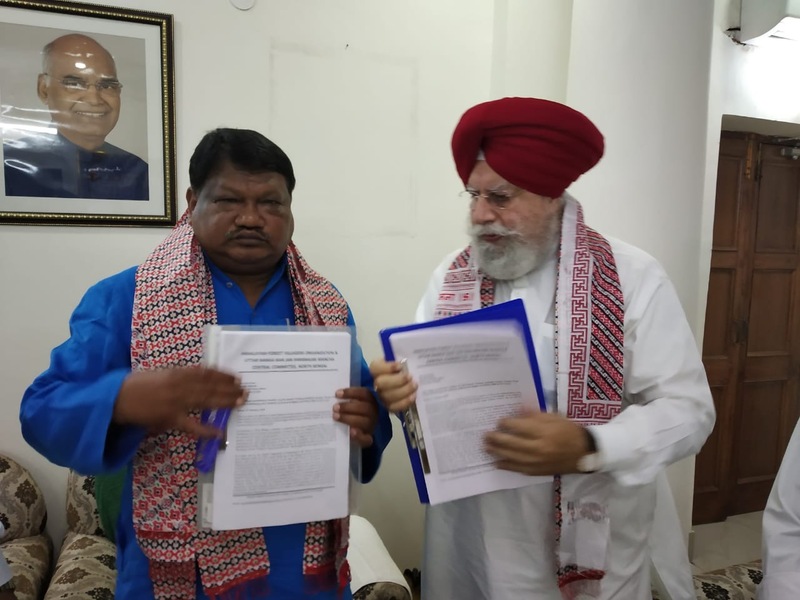 The Honourable Minister for Tribal Affairs Mr. Jual Oram has in turn, informed the delegation today that the Home Minister of India Shri Rajnath Singh has already called him for a meeting to discuss this issue tomorrow 10th of October, at 3 PM. He further assured the delegates that he will be doing his best to introduce a bill to include the 11 left out Gorkha sub-tribes under the ST status in India. The team, led by Shri SS Ahluwalia informed the Minister Shri. Oram, how from 1931 the entire Gorkha community living in India were regarded as “Hill Tribes,” however when the West Bengal Alienation of Land (Temporary Provisions) Act, 1954, better known as the “Absorbed Areas Act” was implemented and Bengal occupied the Darjeeling, Kalimpong Terai, and Dooars, the “Hill Tribe” status of the Gorkhas was conveniently quashed. The delebation reminded the Tribal affairs Minister that despite 71 years of independence, 11 sub-tribes communities have been suffering from the “injustice of recognition”, which has not only marginalized the Gorkhas socially, economically and politically but has continued to deprive our community of the basic dignity to live the kind of lives that they value living. The non-recognition of the distinct and unparalleled historical, cultural and traditional backgrounds of these diverse ethnic Gorkhas, particularly in the Darjeeling and Sikkim Himalayan regions of India, and in Dooars and Terai region of West Bengal, and different parts of Bihar, Jharkhand, Uttarakhand, Himachal Pradesh, Uttar Pradesh, Garwal and Kumaon hills, Assam and other NE states and Bengal amounts to denying their very existence in the first place and thereby perpetuated the historic injustice. The delegation informed the Minister how the Govt of India had formed multiple committees to examine the issue, and how the Honourable Prime Minister Shri Narendra Modi had himself assured the Gorkhas that the government has already started the work towards addressing this historic injustice, back on April 7 2016 itself. 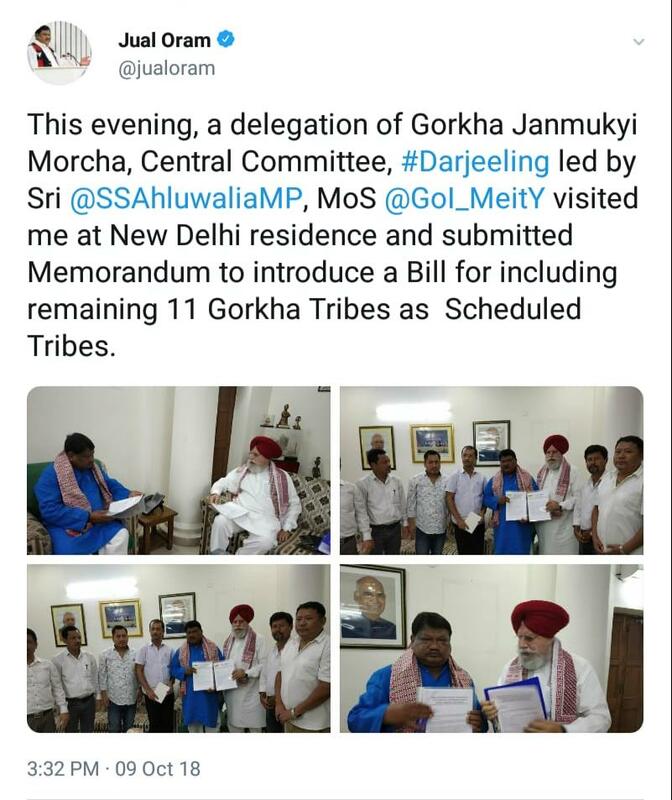 The Honourable MP Shri SS Ahluwalia informed the Tribal Affairs Minister that on October 5, 2018, following instructions from the Prime Minister, the Union Home Secretary met with a team of Gorkha representatives to discuss the Gorkha aspirations for a separate state, and other issues that incorporated inclusion of the 11 Gorkha sub-tribes as ST, and the administrative oppression the Gorkhas are currently facing under the West Bengal government. Be the first to comment on "JUST IN: GJM Demands Introduction of ST Bill in the Winter Session of the Parliament"